One of the great things about Fiasco is how flexible the system is. With no need for complex resolution systems or arcane tomes of back story and special exceptions, games run smoothly as long as all the players are engaged in the story more than they are just being a hero. Battle Pets, the playset we are sharing this week, is one we first crafted shortly after Pokemon Go was announced and has been used successfully at several of our Pokemon related events. Players may be Battle Pet trainers, veterans of the monster wars, hosts of Battle Pets tournaments, or even be crafty battle pets trying to avoid being captured. Win the big tournament, progress to their next evolution, or even learn where monsters come from. Even though we were first inspired to create this set because of Pokemon Go, we play with the "boy and his battle pet" theme so you may find hints of other monster capture games like Monster Rancher, Jade Cocoon, or Digimon. We even previously discussed the long history of this theme on the Inverse Genius podcast IG 008: Pokemon Battle Friends. If you listen you'll hear just how much we love the whole genre, not just Pokemon. The important takeaway is, if you can't find an existing playset you like, or modify one to meet your needs, how easily you can craft a playset based on your favorite settings. Successful playsets don't need to be completely faithful to the source material, which is great because who wants to deal with lawyers anyway? If there is a trick to making a great playset, and I'm not saying there is one, it is just making all of the choices interesting and open-ended. Taking the primary themes and then riffing off those to create an engaging experience is much more fulfilling and interesting than transcribing a setting point by point. Every entry in the set should be approachable and open up more opportunities for exciting interactions at the table. In other words: file off all of the serial numbers, by avoiding setting specific names and places whenever possible, so players don't need to be adepts in the lore. You can count on the players to fill in the name of the headmaster for your school of wizardry, or expand on the big conflict, as they need them. You don't need to spell out everything for the players; it isn't that kind of game. Do you want to be the very best? Like no one ever was? Well get in line kid. Everyone wants to be the best here. They’re all running around trying to shove wildlife into this newfangled pocket dimension device. The cool kids call it the Podide. Or at least I do. Point is, go out there, catch you some creatures, and then pit them against one another in battle. What’s the worst that could happen? Follow the link to our completely unauthorized and totally non-IP-infringing Battle Pets play-set created at the Waccamaw Neck Branch Library in Pawleys Island SC. Posted on December 4, 2017 by Donald Dennis and filed under Tabletop and tagged pokemon fiasco fiasco playsets rpgs. One of the great pleasures of RPGs in general, and Fiasco in particular, is telling stories. Sometimes players tell tales of terror, heroics, power fantasies, or even great tragedy. Fiasco in particular likes to poke fun at elements from some of our favorite genres, themes, or even the pettiness of everyday day life. We thought it'd be great if we shared some of our everyday life with our patrons, and the world at large, by creating a Fiasco Playset that highlights the comically absurd of our experience working in the library. That doesn't mean you'll find our personal stories within this slim volume, or that the deepest darkest secrets of our patrons will be revealed, but if are in the know you may very well see the fingerprints of a librarian who is also a Welcome to Night Vale fan. In other words, imagine the strangest aspects of librarianship writ-large, with the delightful melange of smells, startlingly unorthodox patron interactions, and that one book with the red cover, all with the ability to react how you want because this is a game about bad decisions. We didn't get too much into the the more explicit adventures we've been subjected to as librarians, mostly because this is a YA Fiasco Playset. Though if I had to guess there is certainly room for an Adults Services version; that's a different blog entirely. 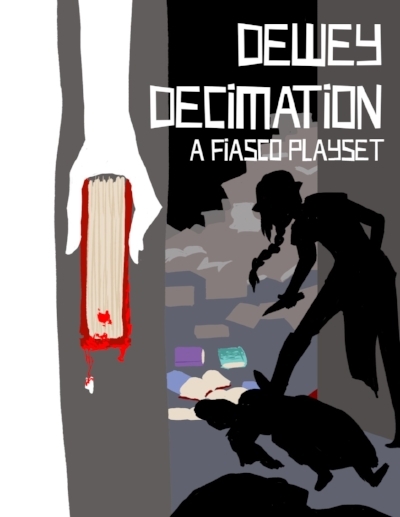 Please enjoy Dewey Decimation, and let us know what adventures you have using the play set. Libraries are weird, and this one is no exception. The staff is quirky, the books are many, and something is always just the slightest bit off. The staff manages to keep the place afloat, but with a ghost roaming the stacks, aliens abducting patrons, and the local PTA’s monthly meetings always going awry things can get... messy. But the books are free, right? Posted on November 15, 2017 by Donald Dennis and filed under Tabletop and tagged fiasco playsets fiasco libraries. As I mentioned previously, we love Fiasco, but many of the the playsets aren't suitable for our Teen Room audience. Creating your own is easy once you are familiar with the system. We have created several playsets at our branch, and our Natural Disaster playset was created as part of an LSTA Eco-literacy grant. This playset has allowed us to engage in ecological topics with our patrons where otherwise they might have been more inclined to other activities. Putting the environment or endangered animals at risk in a very immediate and engaging fashion grabbed their imagination and led to discussions after play sessions about other potential threats or issues. This theme is so rich it would be possible to completely re-write it without covering the same ground. Let us know what you think, or if you make your own variation! And that’s just the little stuff. Here with greedy business tycoons, insane locals, and corrupt government interests, it’s not a question of if something will go wrong but when and how bad. When all these different interests collide there’s bound to be conflict, whether it’s park rangers chasing down vandals, or protesters trying to keep their favorite nature preserve from being plowed flat by the local tycoon. And all that’s not even taking into account the local wolf population. Whether this fiasco is all green, or all on fire, is up to you! Get the Natural Disaster playset. Posted on November 1, 2017 by Donald Dennis and filed under Tabletop and tagged fiasco playsets fiasco LSTA rpgs Bully Pulpit Games.